The Childback Tandem will transform cycling with your child either on the road or the trail. You stay in control when the situation dictates and can maintain speed when your little one is flagging. This is without doubt the best way to enjoy cycling with a little one! Sized to suit a child of 3 1/2 to 10 years (S = minimum seat height of 530 mm - from saddle to pedal) and a pilot from 5'4" to 5'11". Safety Notice: Always use pedals with toe clips and straps for the child on the back. Bought to commute 5yo daughter and myself to school and work. Daughter wanted to get more involved with the riding rather than sitting passively in the cargo bike. 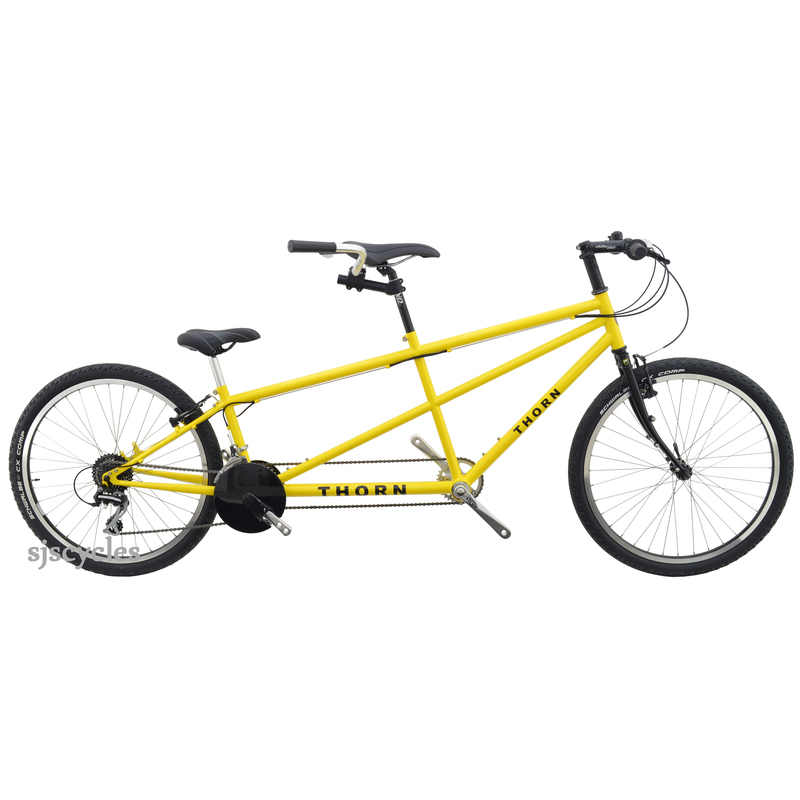 Tried a £2,000 tandem with her, she loved it. Found this somewhat cheaper Thorn online, sold the cargo bike, bought this with the proceeds and change of £400! Any good? Yes very. I had my reservations as the price seemed, well, cheap but it has been excellent and so much fun for me and my daughter! Everything works fine, it feels sturdy with an excellent road manner. Ordering and delivery were faultless too. When number 2 is of age, will likely be buying the triplet. For any information or advice on any of Thorn’s bikes, frames or forks please contact our dedicated Thorn bikes sales team either on 01278 441505 or at sales@thorncycles.co.uk and they'll be able to provide you with all of the information you need.